I can say without any doubt Bill Guerin absolutely loved playing for the Edmonton Oilers, and he felt that way at a time when the glory days of five Stanley Cups were little more than a faded memory. Teammates and fans, in return, felt the same way about Guerin, a speedy power forward from Massachusetts who arrived in Edmonton via the New Jersey Devils in the 1998 trade that sent Jason Arnott the other way. On the ice, Guerin was a lethal blend of speed, toughness and talent who could play the game any way you wanted to. Off the ice, he was a popular teammate with the gift of the gab, a cutting sense of humor and a penchant for pranks. It sucked, then, when Guerin was traded to Boston just 211 games after arriving – a transaction he found out about not from Oiler GM Kevin Lowe, but from a fan at his daughter’s figure skating practice on Nov. 15, 2000. In between, Guerin was a helluva player for the Oilers. It didn’t long after being acquired by Glen Sather for Guerin to become a fixture on Edmonton’s top line alongside captain Doug Weight, who was Edmonton’s best player and would become Guerin’s best friend, and Ryan Smyth. Guerin, who roared up and down the left side, and Weight, silky smooth and a deft playmaker, were a fit. With Smyth banging in the loose change around the net, it was a tremendous trio. 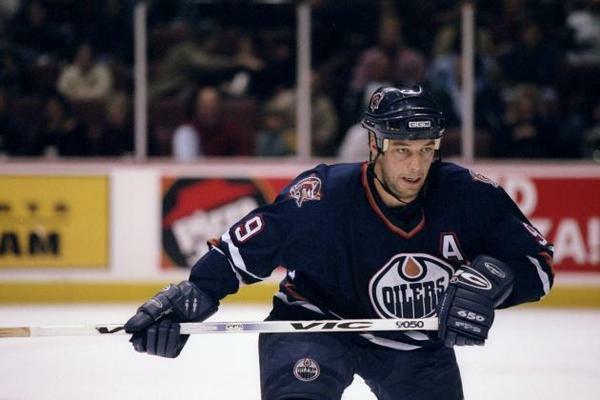 Guerin’s best regular season in Edmonton was 1998-99, when he scored 30-34-64 in 80 games. Guerin’s best post-season here was 1998, when he scored seven goals and had eight points in 12 games – a 4-3 series win over Colorado and a second-round loss to the Dallas Stars in five games. It was in that first-round win over Colorado that Guerin earned the nickname Billy the Butcher for opening up Peter Forsberg with his stick. Guerin and Weight were inseparable off the ice and are best friends to this day. They were particularly adept at cutting up the travelling media – especially when it came to jabs about being out of shape. At the end of one difficult travel day full of delays, the team bus finally pulled up in front of the hotel in St. Louis and Guerin proclaimed, “Free the hostages.” As I bolted for the door, Guerin added, “I said hostages, not sausages” to many guffaws. After that shot, Guerin made a habit of sending me a side of sausages at breakfast when we were on the road. As was the case too often with the Oilers in the 1990s and leading up to a new CBA and salary cap, the November 2000 departure of Guerin, who’d won a Stanley Cup with the Devils in 1995, was as much about finance and a tight budget as it was about hockey. Guerin was dealt to Boston for Anson Carter and draft picks that turned into Ales Hemsky and Doug Lynch. It was a tough day as stunned teammates rushed to Guerin’s house. “It’s bittersweet. Actually, it’s not sweet,” said Guerin. ”I’m just disappointed at the timing. With the way things were going, I thought I’d found a home here, but you have to be professional about this I guess.” Added Weight: “I’ve got to sleep on this one. I don’t know what to tell you. Obviously, this is a time that’s difficult. Billy’s a big part of this team and a big part of my life. He’s a very close friend of mine and that’s first and foremost. I’m disappointed he’s leaving.” My story from that day is here. After a 41-goal season with Boston, Guerin signed as a free agent with Dallas for the kind of money — $40 million over five seasons – that was simply an impossibility in Edmonton. Even then, and in later stops in St, Louis, San Jose, Long Island and Pittsburgh, where he’s now the assistant GM, Guerin always made a point of talking about his time in Edmonton. Like Weight, who’d be traded by the Oilers just over eight months later, Guerin never wanted to leave. What I wouldn’t give to have a Guerin type winger on the Oilers today. He would score 50 with McDavid. For those too young to remember, this is one reason I will never boo Gary Bettman; his salary cap ended these ridiculous trades made only because the “have” teams were killing us “have-not” teams with insane contracts. Fair enough. I know what you are saying. On the same topic – Ever look at who the “have” teams were in the 90s and where they are today? Dallas Stars, Colorado Avalanche, Phoenix Coyotes and a few others were destination teams playing in big American markets whose owners understood what it took to win and were aggressive in free agency. I think they were less “have” teams and more teams that had generous credit. Because they are all broke today. That late 1990s team was so close to being a contender. Finances prevented them from taking the next step. Guerin, Weight, Cujo, Smyth and Hamrlík could have formed a nice long-term core if the Oilers could have afforded to keep them. RB………the sausages thing made me laugh! This has been a long haul for you writing all these articles on the top 100. I for one love these articles, especially when there are side-bar stories which in my mind make the series…….just so you know. Thanks. Guerin and Weight were a lot of fun to be around. Bill Guerin was my favourite all-around Oiler of that era, and I was devastated to see him traded (though I became a huge Anson Carter fan!). Getting him for Arnott was a blessing in disguise, and I followed his play with the Devils before Sather cut Arnott lose. I was one of the few who was glad for the trade (the mood around here towards Arnott was not completely dissimilar to that surrounding Justin Schultz before he left – both the fans and media decidedly turned on a skill player who just couldn’t lift the team on his own, or have the mental toughness to the “that guy” in a small market where the cupboard was usually pretty bare). I posted this in the mailbag today as I didn’t know Bill was being spotlighted today by RB. Read the link, he was hated by Colorado media. The butcher of Edmonton is what the Denver media would call him, read this for a trip down memory lane. I remember in 2000-01, the line of Weight, Guerin and Smyth was the hottest line in the NHL those first 21 games and they traded him. My favourite memory of Billy G was in that playoffs where he scored 7 goals, three of them came in a hat trick against Dallas. In fact im almost sure Dougie and Guerin scored hat tricks in back to back games in that series (one win and one loss), I think they lost that series in 5. My favourite part about that wasn’t the actual hat trick, but the call on the highlight package on the score from Tim Mcallef later that night, “trick please! Billy the kid’s got three”. I was 18 at the time and for some reason I have thought about that line at least once a month for the last 19 years. I said free the hostages NOT sausages. Great story. Bill was living the hockey life in a hockey city. Curious who you’d think of as the closest modern comparable to Guerin. Was thinking maybe Marchand. I was thinking Dustin Brown before he got broke. Aside from having a physical component, Brown is a pretty big step down in skating and scoring when you look at their careers. Guerin scored 30-or-more goals five times, including two seasons in the 40s. Brown has hit 30 once and likely won’t do it again. Tough to compare a lot of guys to Guerin because of the scoring, skating and toughness dimensions. Some guys have two of them, but few have all three. RB. You are going to write a book on all of this some say, right? Edit: Ah, nutz. Some DAY. I second this. With better spelling, perhaps. Would it be gauche to get a new Guerin jersey to wear to games? He never wore the old school silks.